Are you looking for the perfect focal point to your outdoor space? Or a way to extend use of your landscape? Great Falls, VA winters bring cold weather and dark nights, making it difficult to enjoy your outdoor space as much as you want to. But with a custom fire pit designed and installed by O’Grady’s Landscape, you can bring added warmth and light to your yard so you can entertain guests outdoors year round. 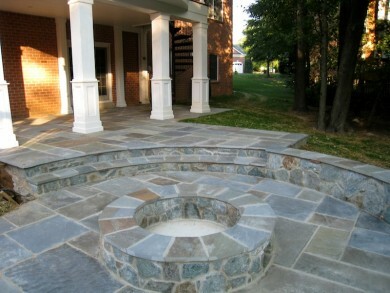 If you are ready to install a fire pit for your Great Falls, VA home, contact O’Grady’s Landscape today! Call (703) 533-5001 for your free estimate. Whether you want to create a focal point to your backyard landscape or a gathering place by the swimming pool, our Great Falls area landscapers can help. We will work with you to create a custom fire pit design based on your aesthetic and functional goals, the scope of the surrounding landscape, your budget, and any other requirements you may have. We are happy to recommend material choices to complement nearby hardscapes. Have a different idea for unique fire pit designs? Need help or suggestions? Just ask one of our landscapers during your design consultation, and we’ll help you determine what’s feasible for your outdoor space after an assessment of your property. At O’Grady’s Landscape, we help clients throughout Great Falls create custom-built fire pit designs to reflect their sense of style and maximize functionality. Our goal is to help you accomplish all your goals for the picture-perfect landscape, extending the use of your backyard space while adding nooks for socializing and outdoor parties. And, of course, we strive to create fire pits that are as stunning as they are functional.